Company: Drew, Cooper & Anding, P.C. 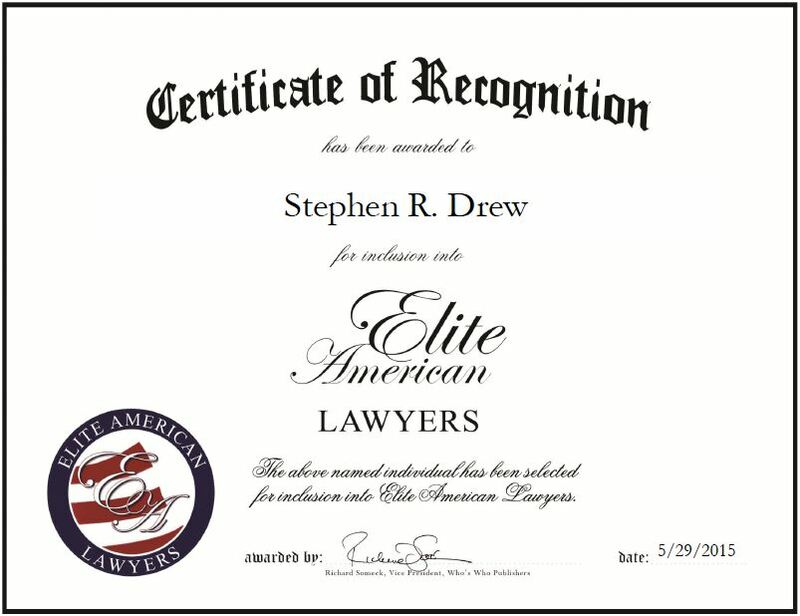 Grand Rapids, MI, May 29, 2015, Stephen R. Drew, Founding Partner, Attorney at Drew, Cooper & Anding, P.C., has been recognized by Elite American Lawyers, fro dedication, achievement and leadership in employment law. Mr. Drew knew at an early age that he wanted to be a lawyer, where he could fight for the civil rights of people and racial discrimination. He pursued a career in the field and has been a practicing attorney for four decades. Dedicated to providing his clients with the highest quality legal services, Mr. Drew is responsible for representing clients against entities in the areas of employment law, personal injury, police misconduct and sexual harassment. Mr. Drew is an AV Preeminent Attorney who would like to be remembered as someone who fought hard for the his clients’ rights. He also wants to be remembered as being ethical and making a positive difference. He has worked hard to develop a strong reputation in the industry and prides himself on giving each case 100 percent. Mr. Drew feels he has been able to excel in the field due to his strong team surrounding him, always wanting to learn more and to enjoying what he does. Moving forward, Mr. Drew would like to have continued growth and success with his firm, as well as being an advocate for his clients and their rights. This entry was posted in Employment law and tagged AV Preeminent Attorney, civil rights, personal injury, police misconduct, racial discrimination, sexual harassment. Bookmark the permalink.